Rent the whole house for 2 or more nights for $337.50/night for up to 6 people (10% savings). Add up to 7 more people for $25 each per night. South Louisiana is a Hunter’s Dream and Crawfish Haven/Mrs. 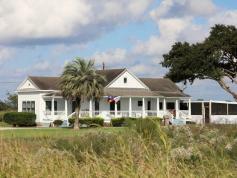 Rose’s Bed and Breakfast will comfortably accommodate the hunters in your group. Enjoy a hot breakfast each morning before you head out to your hunt. Call 337-652-8870 for more info and ask for the “Hunter’s Special“. Not available when booking online – you must call.